The concept of an “Indo-Pacific” system – a strategic arc – is not new, but it is still developing. Linking the Indian Ocean with the western Pacific Ocean as a single entity will help to create a more effective and truly regional security structure. India’s role thus becomes much more prominent and, hence, its long-term vision should be to either modify or revise the “Look East Policy”. India and Australia could take leading roles in helping to secure this emerging strategic system. The Indo-Pacific is a critical part of the global commons. It is thus in the interests of all countries with a stake in the region that China, too, should be integrated into it and made an integral part of the emerging Indo-Pacific strategic system. This Strategic Analysis Paper highlights the growing discussion of the concept of the “Indo-Pacific”, a strategic arc that aims to bind the Indian Ocean to the western Pacific Ocean as one single entity. This would provide an effective structure for a security system, which could protect the maritime and strategic interests of the countries holding high stakes in the region. The concept has generated debates in India, which, according to our research, have illustrated the differences of opinion among the experts and analysts in the field. The aim of the paper is to analyse the importance of such a system, whether it should exist and India’s perceived role in it. It also makes some recommendations based on the analysis. The paper explores some possibilities that could assist in finding a smoother, option for the pursuit and achievement of an “Indo-Pacific” strategic system. The Asia-Pacific region is undeniably the present centre of focus for all the major powers. Its growing importance, however, also increases the vulnerability of the region, because of growing competition among the great powers. In this scenario, where there is a developing struggle for resources and strategic vantage points, India is making its presence felt in the region. It has the goodwill of all the regional states, as well as the extra-regional powers, because the rise of India is viewed as a benign development and not a cogent threat. Countries around the world have come to recognise India’s strengths and are, therefore, expecting more from India than before. Tapping into this opportunity to explore further gains in the region, will require India to look beyond the South China Sea. The long-term vision should be to either modify or completely revise the “Look East Policy” and focus on devising a new Pacific Policy for India within the general concept of the “Indo-Pacific”. That concept originated in the 1970s, but is still developing – an emerging Asian Strategic System to encompass the ongoing changes in the Asia-Pacific region. The past year has seen the term gain momentum in Indian strategic debate. Although still at a very nascent stage, it is gradually gaining prominence among strategic and foreign policy analysts. 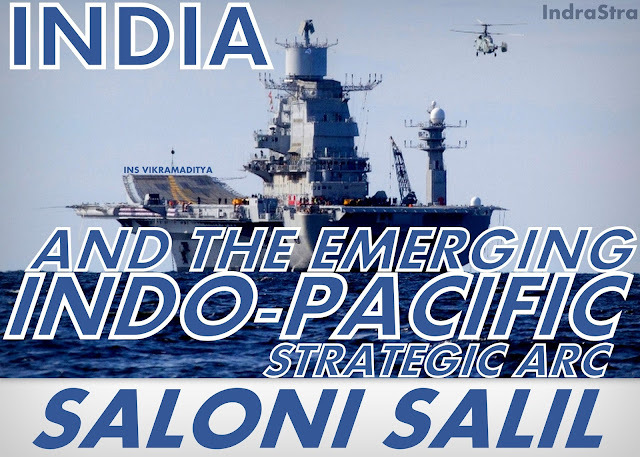 From a geopolitical perspective, it represents the inclusion of the western Pacific within the range of India’s security interests, thus stretching beyond the traditional focus on the Indian Ocean theatre. The Indian Navy’s 2007 doctrine, Freedom to Use the Seas: India’s Maritime Military Strategy, for instance, defined India’s area of interest as that which ‘extends from the north of the Arabian Sea to the South China Sea’. India, due to its key geographical location in the Indian Ocean region, naturally becomes an important player in the new concept of an “Indo-Pacific” strategic maritime system; where the Indian and Pacific Oceans would be linked in a structure that managed by the United States, India and Australia. The concept has only been possible due to India’s growing economic engagement in the region with ASEAN, China and Japan and, more recently, Australia. This change has resulted in a growing density of maritime traffic through the Indian Ocean and radiating out into the western Pacific littoral. The responsibility for securing this strategic system could possibly be shared by India and Australia, as both are important stakeholders in the Indo-Pacific region owing to their geographic locations. India stands at a pivotal position in the Indian Ocean Region, with all the major elements necessary for a country to be termed a “Major Power”. With its long coastline on the Indian Ocean, the Himalayas as a natural defence against two neighbours, a developing bluewater navy, its record as a responsible nuclear-armed state, a growing economy and a strong regional military force, India is striving to expand its foreign policy. The combination of these factors has caused the world to pay more attention to India. With the United States identifying India as a linchpin of the region and seeking New Delhi’s support for its strategic shift towards the Asia-Pacific, India could naturally be seen as an Asian leader. At the same time, however, debate in India suggests two divergent views. For many, the inclusion of the term “Indo” in Indo-Pacific will make India’s position in the region more authentic. For them, India would be justified in claiming a national interest across the region and it could then tailor its policies accordingly. But others feel that it is too early to make a major shift in India’s foreign policy, based on a terminology coined by the United States (Hillary Clinton first used it in October 2010) and which some see as an attempt to establish the “Triple Alliance” between India, the US and Australia proposed earlier. To paraphrase former Australian Defence Minister Kim Beazley, the Indo-Pacific region not only brings together two of the planet’s most important bodies of water, but also two of the world’s most geo-politically, geo-economically and geo-strategically interconnected regions. Due to the growing appetite of major economies for the energy reserves that are in abundance in these resource-rich regions, the Indo-Pacific has become highly contested in places, with overlapping claims in various areas by states attempting to gain uninterrupted access to energy supplies. The concept has also raised concerns in relation to China. It is perceived by many in China as an attempt to exclude it from the region, by establishing a strategic arc to balance Beijing’s aggressiveness in the South China Sea and to counter any Chinese expansionism. But, not only would that not play well with China, it probably would not be embraced by those countries that share an economic relationship with China, including India and Australia. If such a scenario were to occur, it could further complicate, or even worsen, the strategic environment. The Indo-Pacific region is, as Kim Beazley has noted, a critical part of the global commons – with the United States, India and China all active in it. It is, therefore, in the interests of all the other countries with a stake in the “Indo-Pacific”, that China should be integrated into it and made an integral part of a strategic system in which the onus for maintaining peace and stability lies with its stakeholders. This article was first published at Future Directions International's Website. Saran, S., ‘Mapping the Indo-Pacific’, Indian Express, 29 0ctober 2011. <http://www.indianexpress.com/news/mapping-the-indopacific/867004/4>. Gnanagurunathan, D., ‘India-Australia in the Indo-Pacific: a Blossoming Partnership’, Indian Council on World Affairs, 21 December 2012. <http://icwa.in/pdfs/VPIndopacific.pdf>. ‘Hillary Clinton Lauds India's Role in Indo- Pacific Region, Urges for Increased Participation’, India Today, 14 November 2012. <http://indiatoday.intoday.in/story/hillary-clinton-lauds-indias-role-indo-pacific-region-talks-china-breifly-in-australia/1/229136.html>. Gupta, R., ‘India puts the Indo in “Indo-Pacific”’, Asia Times Online, 8 December 2012. <http://www.atimes.com/atimes/South_Asia/ML08Df03.html>.